Senator Elizabeth Warren spoke Friday during a campaign appearance in Claremont, N.H.
CLAREMONT, N.H. — US Senator Elizabeth Warren made her second trip to New Hampshire in less than a week Friday evening, introducing herself as an economic populist to a crowd eager to size her up as a potential Democratic challenger to President Trump. In front of 300 people on a cold Friday night in the rural western part of the state, Warren began by saying it was time to reopen federal government, which has been partially shut down for 28 days — already the longest shutdown in American history. Warren took seven questions from the audience during the hour-long event. Some asked about issues like the cost of higher education, climate change and immigration. But two of them had questions about Warren’s viability as a candidate. On the first question, she admitted she doesn’t know how she will win. Questions about Warren’s heritage have stuck with her for years, after it emerged during her 2012 US Senate race against Republican Scott Brown that she had listed herself in law school directories as Native American. After President Trump took up the line of attack, Warren last year took a DNA test that showed she likely had a trace of Native American lineage. Some in Claremont wondered why she chose to publicize the results of that test, a decision that again elevated the issue. Ray Gagnon, a Democratic powerbroker in Claremont, said he’s heard a knock on Warren around his area that she can come across as an academic elite who cannot relate to the everyday life and challenges of working class. Jean Fahey, 68-year-old school teacher from Claremont, agreed. “I think she has big dreams and I have big dreams too,” said Fahey, who came away “impressed” by Warren but far from supporting anyone in a yet-to-be-defined field. Warren could be sending two signals with her choice to visit Claremont, far away from the Democratic primary voters concentrated on the other half of the state. First, as she told reporters afterward, she planned to campaign all over the state, especially in places like this remote blue-collar city that voted for Donald Trump in the 2016 election after decades as a Democratic stalwart. It’s also notable that Warren held her event in the backyard of Bernie Sanders, whose son lives in Claremont, located just over the Connecticut River from Vermont. In the 2016 Democratic presidential primary, Sanders beat Clinton 68 percent to 27 percent in Claremont. Should Sanders join the race this time, Warren hopes to be able to beat Sanders in places like Claremont. 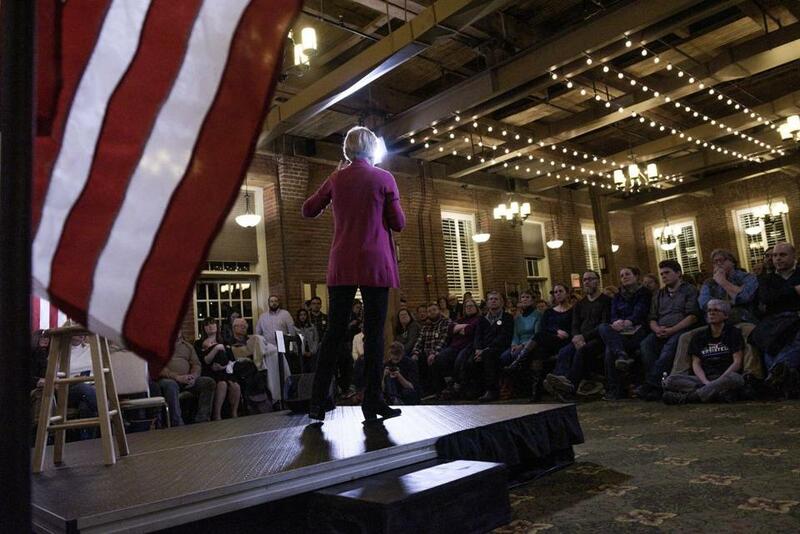 This was Warren’s second trip to New Hampshire since she formed a presidential exploratory committee Dec. 31. Before her event in Claremont, she did an interview with a local television station and stopped by a pub in New London to grab food and greet diners. She has also been to Iowa and is planning to hold an event in Puerto Rico on Tuesday.